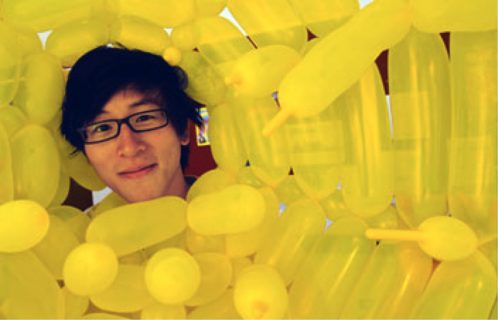 Willy Chyr didn’t find balloon art—balloon art found him. 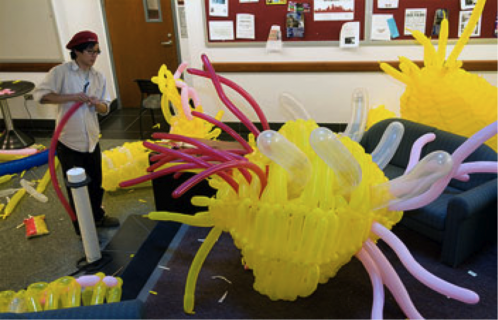 The fourth-year in Physics received an email seeking a balloon artist from the coordinators of Summer Breeze, the University’s annual spring carnival, in 2007. Chyr’s inexperience didn’t deter him from slightly inflating his balloon-twisting skill level when he answered the message. The hourly pay for the gig was $30. Chyr’s impulse soon became his passion. 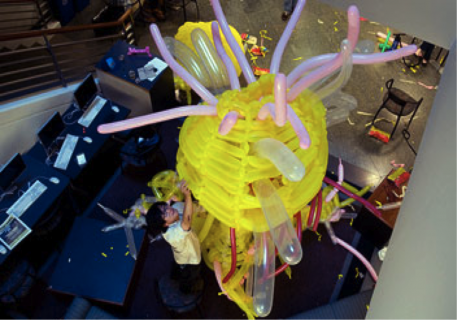 Now a skilled balloon twister who performs at a variety of Chicago-area functions, Chyr uses his talents for increasingly innovative and quirky projects. At the opening of the 2009 Festival of the Arts, which features student fashion designers, six models walked the runway in Chyr’s designs—six dresses made entirely from balloons. Chyr’s current project, titled “Balluminescence, The Life and Death of,” is his most ambitious yet, and includes two massive balloon sculptures that are embedded with strings of colored LED lights. Translating that initial flash of creativity into a finished sculpture required creative financing. To help with the cost of balloons, lights, and electronics, Chyr wrote a proposal to get financial support from the University Arts Council’s Student Fine Arts Fund. Each of the two sculptures was built over a three-day marathon work session in the Biological Sciences Learning Center. The team started on a Friday night, working on the electronics that would control the LED lights. Using an Arduino, a tiny computer designed to control simple lights or motors, the team programmed the Arduino board to turn the lights on and off in sequence, creating patterns in the colored lights. By Saturday, the group was twisting balloons. By the end of the day, Chyr was ready for a break: “My fingers were hurting and the electronics weren’t working,” he says. They simplified the design for their electronics, and before long, the Arduino was working beautifully. “It’s slightly less grand than the original plan, but we get the point across,” explains Pesyna. Eight-hundred-fifty balloons later, minus the 100 that popped, the sculpture was ready for the next construction phase. On Sunday, they carefully placed the LED lights inside the sculpture. Finally, after working all weekend with few breaks, they attached the sculpture to invisible wire and hung it from the main staircase of the BSLC. The sculpture seems to be suspended in air—think floating neuron meets neon octopus. A twisted chain of pink and yellow balloons connects three enormous yellow spheres, each accented by red and white balloons jutting out from all angles. Just below hangs another yellow dome that flares out into multi-colored tentacles. Chyr says, for this sculpture he wanted to explore using the BSLC architecture and the space created by its staircase. “First, I just had a vague image, and then I just let it stick around in my head and develop for a few weeks.” He then experimented with colors and shapes, allowing the creative process to develop organically. “How the balloons are actually twisted together during construction is very much improvised,” he says.